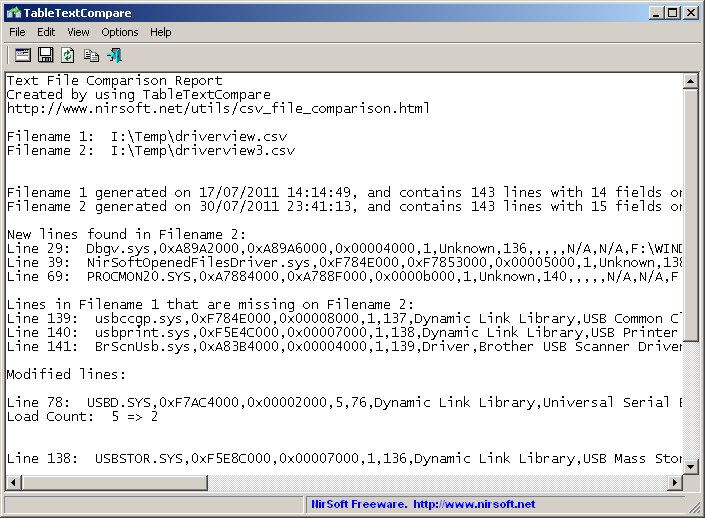 CSVFileView - CSV/Tab-delimited file viewer and converter. For example, You can use DriverView utility to save 2 snapshots of loaded drivers list into a tab-delimited file, and then use TableTextCompare to easily find out which device drivers were added, removed, or changed since the time that the first snapshot was taken. TableTextCompare can make the comparison even if the records of the 2 files are not sorted in the same order, or if the fields are not positioned in the same order. Fixed bug: on some files, TableTextCompare detected added lines as modified lines. Fixed TableTextCompare to save the Fast Mode settings to the config file. Added 'Fast Mode', which works much faster if you have 2 large files the are sorted by the same field and have a small amount of differences. Fixed bug: In some cases, TableTextCompare failed to detected added/removed lines. Added 'Show Line Numbers' option. If you turn it off, the line numbers of modified/added/removed lines will not be displayed. This utility works on any verion of Windows, starting from Windows 2000, and up to Windows 7/2008, including x64 versions of Windows. This utility uses a very complex algorithm to detect the changes that have been occurred between the 2 csv/tab-delimited files. However, this algorithm is not 100% perfect, and it's possible that with very complex files and a lot of changes, the comparison report won't be 100% accurate. Save 2 snapshots of loaded drivers list into a tab-delimited file, by using DriverView utility, and then use TableTextCompare to find out which device drivers were added, removed, or changed since the time that the first snapshot was taken. Save 2 snapshots of services list into a tab-delimited file, by using ServiWin utility, and then use TableTextCompare to find out which services were added, removed, or changed since the time that the first snapshot was taken. If you want to compare snapshots of data from other software, and that software displays the data in a standard ListView of Windows, you can use the SysExporter utility to grab the data and export it into csv or comma-delimited file, and then you'll be able to use TableTextCompare to compare different snapshots of data. If you have 2 different Excel files with tables that you want to compare, you can export these tables into 2 .csv files, and then use TableTextCompare to compare the exported csv files. When you export data from any NirSoft tool to csv/tab-delimited files, for using with TableTextCompare, it's recommended to turn on the 'Add Header Line To CSV/Tab-Delimited File' option, and then in TableTextCompare, turn on the 'First line contains the column names' option. Using csv/tab-delimited files with column names in the first line ensures that the comparison process will be accurate even if the columns are positioned in different order. Also, the column names will be used in the report for specifying which field has been changed. After running TableTextCompare, choose or type the 2 csv/tab-delimited files that you wish to compare, and then press the 'Ok' button to get the comparison report. You can also drag the 2 files from Windows Explorer into the main window of TableTextCompare. Be aware that if the first line of every file contains the column names ('Add Header Line To CSV/Tab-Delimited File' option in NirSoft utilities), you should check the 'First line contains the column names' option. New lines found in Filename 2: This section displays all lines that exist on the second filename, but doesn't exist on the first one. Lines in Filename 1 that are missing on Filename 2: This section displays all lines that exist on the first filename, but doesn't exist on the second file. Modified lines: This section displays the difference of lines that exist in both files. /FastMode <0 | 1> Specifies whether to use fast mode (0 = no, 1 = yes). /ShowLineNumber <0 | 1> Specifies whether to show line numbers (0 = no, 1 = yes). Here's an example of report created with TableTextCompare, comparing 2 comma-delimited files of device drivers list generated by DriverView utility. Also, for USBSTOR.SYS - the address has been changed from 0xF5E8C000 to 0xF794E000, and the index from 136 to 139. Filename 1 generated on 17/07/2011 14:14:49, and contains 143 lines with 14 fields on each line. Filename 2 generated on 30/07/2011 23:41:13, and contains 143 lines with 15 fields on each line. A file named TableTextCompare_lng.ini will be created in the folder of TableTextCompare utility. After you finish the translation, Run TableTextCompare, and all translated strings will be loaded from the language file. If you want to run TableTextCompare without the translation, simply rename the language file, or move it to another folder. TableTextCompare is also available in other languages. In order to change the language of TableTextCompare, download the appropriate language zip file, extract the 'tabletextcompare_lng.ini', and put it in the same folder that you Installed TableTextCompare utility.